I’ve been aiming to inspire the URI Harrington School graduates by tweeting out information about three job opportunities each day. Check out out my Twitter feed to find them! It’s not hard to find great jobs that our grads are qualified for, even in a difficult economy. That’s because if you’re a good writer, know how to find and analyze information in a variety of forms, have great communication and collaboration skills, and know how to use images, language, sound and social media to express and share ideas, you are employable in today’s workforce. And some of the starting salary positions in social media hover around $65K plus benefits. For this reason, I was quite taken by the recent report entitled, Future Work Skills 2020 from the Palo Alto based Institute for the Future. This infographic nicely captures the broad technological, economic and cultural forces operating now and into the future — and how they will shape the core competencies needed in the work force of 2024. 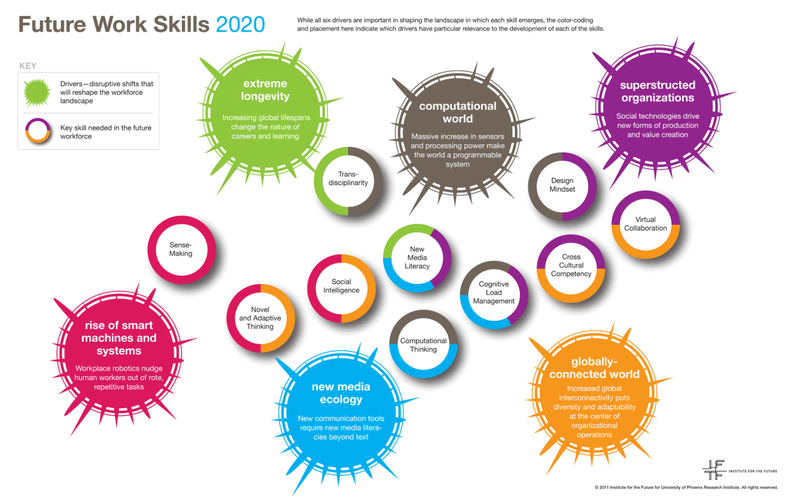 All in all, it’s a nice map that suggests the factors that are shaping the jobs of the future and the interconnectedness of these new life skills and workplace competencies, which are so necessary to thrive in a digital world.